This was a lot of fun and seeing it with a big, engaging crowd really fueled the fun factor. This is the best way to describe it. This is like a: post-apocalyptic, extremely violent and gory, live-action Saturday morning cartoon show with an 80’s vibe. It’s a weird combination, huh? But, that’s why I like it so much because it’s supremely unique. This movie has it’s own voice and creates an identity it can call it’s own. It’s the definition of being unique and I don’t see anything like this being replicated soon. The directors creates a mixture of Mad Max, a comic book and a 1982 futuristic music video and rolls out this hilarious, cheesy result. Anouk Whissell, Fracois Simard and Yoann-Karl Whissell knew what they were going for and made it self–aware and never took it seriously, except for a few scenes that were kind of touching. 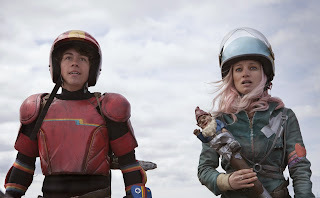 The main story revolves around Turbo Kid, I actually want to refer to him as that in this review, who is surviving in this desolate wasteland ran by a character named Zeus and he kills people to extract clean water from their bodies. 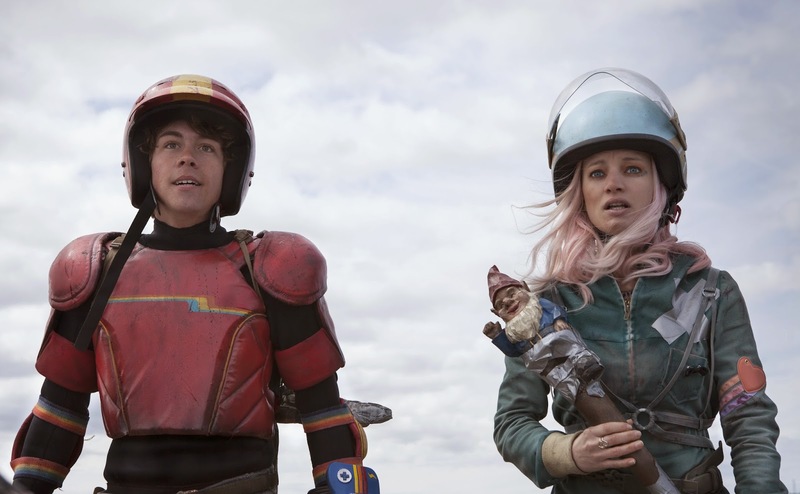 Turbo Kid meets a lovely, eccentric girl named Apple and they band together with a cowboy to take down Zeus. At this point in the review I rest assure you that you are not high right now and this is the movie’s description. This story is about survival and over throwing the dictatorship and it’s told in a violent tone with over-the-top, comedic gore. The directors really do not shy away from the violence or gore as it goes into hard R territory making Kill Bill look like an afternoon episode of Barney. It’s campy, ridiculous and the directors fused this hybrid of styles and genres to have this very slick and bloody new beast. The acting is good in it’s own right. The material is fun and ridiculous and you can tell all the actors and actresses are having a load of fun and that made me have more fun. It’s filled to the brim with great one-liners and they all deliver them with straight faces and it put a smile on my mine. The cinematography, for an over-the-top ride like this, was actually really great. The deep, rich grays of the landscapes really capture a great post-apocalyptic with clean camera shots for some great eye candy. What I enjoyed the most was having those bright, loud colors in contrast to the barren, bleak landscapes. It was a nice balance for the yes and made the colors pop out more. The movie is only 89 minutes long and it felt longer, it a good way. I was so sucked into this cool world and the story presented, I felt like I was watching a more than two-hour epic. But for 89 minutes, it does fly by and it’s actually a perfect length for this type of movie. With an electronic 80’s beat to go along with it, you will also be tapping your foot making the experience faster and more enjoyable.